This coming Tuesday, Alabamians will go to the polls to decide their next U.S. senator in a rare December special election. While the Yellowhammer State is heavily Republican — President Donald Trump carried it by 28 percentage points in 2016 — the Senate contest is a Toss-up. The candidacy of the Republican nominee, former Alabama Supreme Court Chief Justice Roy Moore, became toxic in early November following reports that he had previously sexually harassed and romantically pursued underage girls. These credible allegations, supplemented by further evidence this past Monday from a woman who was in a relationship with Moore when she was 17 years old, have given former U.S. Attorney Doug Jones (D) a real chance to win in conservative Alabama. The polls indicate that Moore holds a slight lead, one within a reasonable survey error range. The RealClearPolitics average finds the Republican ahead by 2.3 points, while an average of the last eight polls (some of which RCP did not include) shows Moore up 2.5. The point is, it seems close. Moreover, pollsters’ collective lack of experience in surveying typically-uncompetitive Alabama and the odd timing for the election — just two weeks before Christmas — may be making it quite hard to accurately model the electorate. As the race enters its final days, there are reasons for optimism on both sides, though because of Alabama’s conservatism, we suspect the Moore team may have more reason for it. For Moore, many institutional elements of the GOP have seemingly fallen back in line with their party’s nominee. On Monday, the president endorsed Moore, and news broke shortly thereafter that the Republican National Committee would once again support the GOP nominee, having previously backed away from Moore after the allegation about underage girls came out (though it should be noted that a subsequent report suggested the RNC’s renewed support is mostly symbolic). Senate Majority Leader Mitch McConnell (R), who had earlier called on Moore to drop out of the race, was asked in a Sunday interview if Moore should be allowed to serve in the Senate — the idea of expelling Moore should he win has been floated — and McConnell replied that he would “let the people of Alabama make the call” (he later walked back those comments on Tuesday). These developments, most especially the support of the president — who will campaign on Friday in Pensacola, FL, which lies right next to the southeastern corner of Alabama — may help Moore sufficiently bring home wayward parts of the GOP base to win next Tuesday. Remember, Alabama’s electorate is quite “inelastic”; that is, its principal voting blocs are usually solidly in one party’s camp or the other. Roughly half of the state’s electorate tends to be white evangelical, probably the most Republican demographic group in the country, while around a quarter of the electorate tends to be black, easily the most Democratic-leaning group. Support from the president may help Moore shift the election back toward Alabama’s more-typical inelasticity among white Republican-leaning voters. Following the president’s endorsement, the super PAC America First Action (a wing of the Trump-backing America First Policies organization) announced that it would spend $1.1 million on advertising to support Moore. Given Moore’s fundraising woes, this late assistance could be enough to get him over the top. For Jones, he has been able to raise and spend a lot more money than Moore. The most recent campaign finance report for Oct. 1 through Nov. 22 showed the Democrat had outraised the Republican $10.1 million to $1.8 million and had outspent him by $8.4 million to $1.7 million. According to Advertising Analytics, Jones has a 10-to-one media spending edge over Moore. While money is not a sure-fire way for Jones to overcome Alabama’s strong Republican lean, having a large and sustained spending advantage can help a candidate gain a lasting effect from advertising. Additionally, the overall political environment could aid Jones, namely the fact that Democrats appear to be more energized based on this year’s special election results for various legislative offices around the country and recent statewide elections in New Jersey and Virginia. In an unusually-timed special election where one side may have an enthusiasm advantage, Jones might be able to win. Still, this may end up being a result similar to the special election in Georgia’s Sixth Congressional District earlier this year, where Democrats got their hopes up for a victory but the Republicans held on for a close win. With the election coming down to the wire, we asked ourselves this question: What might a Jones win look like? Naturally, there is no definite answer prior to the election. Complications include: what percentage of GOP voters will vote for a write-in candidate, will GOP turnout be depressed because of the allegations against Moore, will black turnout be poor (a key question in a state whose electorate is sharply polarized by race), and how high will turnout be overall? Based on recent election results, we can attempt to map out what a Jones win could look like. Before starting, it’s important to say that the analysis that follows is absolutely not a prediction of what will happen next Tuesday. Because Republicans regularly win statewide elections in Alabama, it’s easy to visualize a Moore win. Looking at Jones’ path will allow us to dig into some factors that make this race appear so competitive, even if Moore is probably slightly more likely to win than not given the Yellowhammer State’s conservative nature and racially polarized voting a state where whites significantly outnumber blacks. First, it’s useful to get some idea of where the votes come from in Alabama. Map 1 shows both a map of the major population areas of the state and a map of the average share of the vote by county over the past four major statewide elections — 2010 Senate, 2012 president, 2014 governor (the Senate race was uncontested), and 2016 president. Notes: Click to enlarge. “CSA” is a Combined Statistical Area, “MSA” is a Metropolitan Statistical Area. Unsurprisingly, Jefferson County (home of the state’s largest city, Birmingham) is far and away the home of the most votes in Alabama. Since 2010, it has averaged 14.3% of the statewide vote. 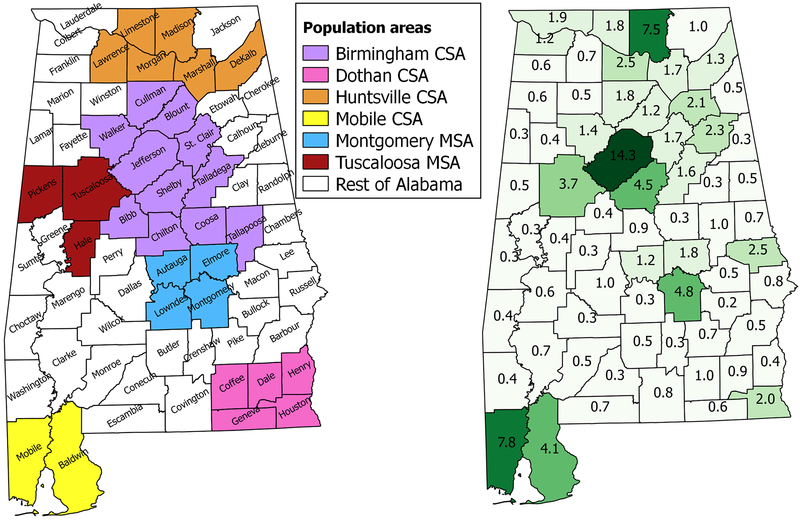 Overall, 29% of Alabama’s 2016 presidential vote came in Birmingham’s combined statistical area (CSA), which also includes Shelby County to the southeast (4.5% average). The other two major sources of votes are at two geographical extremes — to the north is Madison County, home of Huntsville (7.5% average), and to the south is Mobile County (7.8%). 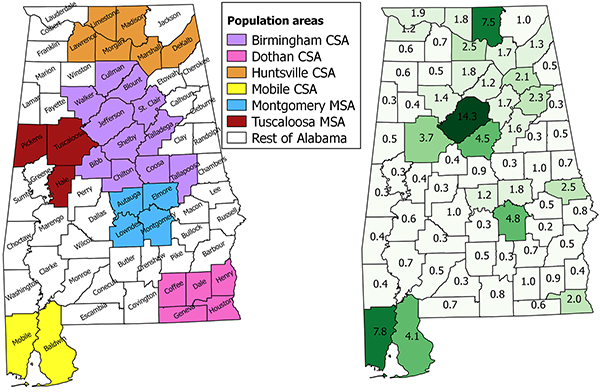 The Huntsville CSA contained about 16% of Alabama’s 2016 vote while the Mobile CSA had about 13%. The other major vote source is Montgomery County, home of the state’s capital, which averaged 4.8% of the statewide vote from 2010 to 2016. Further analysis will refer to these averages, but just how close (or off) these averages are from the makeup of the 2017 special election could be crucial. For instance, a higher share of the vote in Democratic-leaning Jefferson could help Jones to victory, while a weaker showing there would be good news for Moore. Next, the most useful electoral baseline for understanding the potential path to victory for Jones (or path to a defeat for Moore) is the Republican nominee’s 2012 election for chief justice. In that contest, Moore only narrowly beat the Democratic nominee, Bob Vance, 51.8% to 48.2% in the two-party vote (there were around 2,000 write-in votes). In that election, Moore ran far behind Mitt Romney, who won 61.2% of the two-party presidential vote in Alabama. 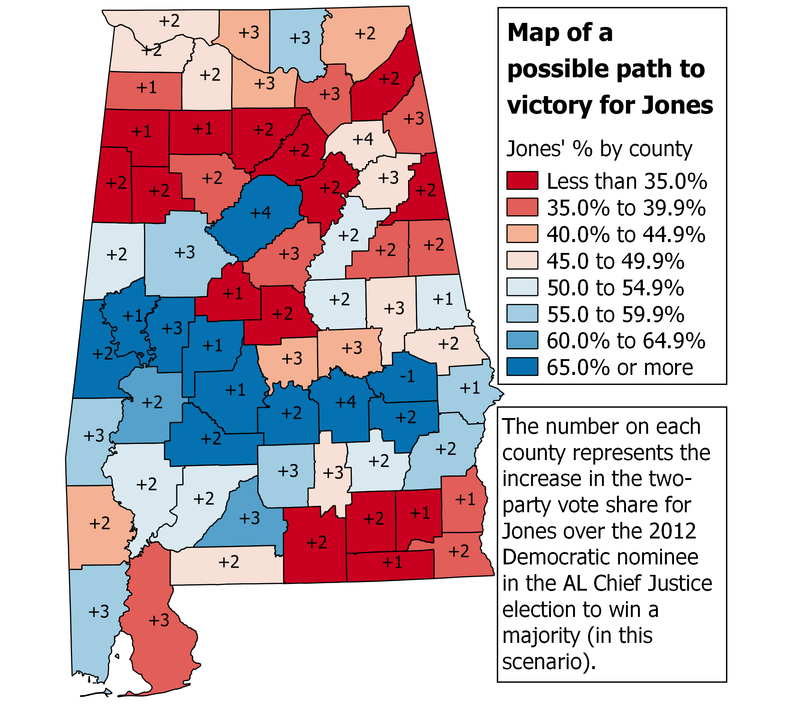 While Moore won, the chief justice election showed what kind of map could give a Democrat a chance to win in Alabama (and, conversely, the patterns of county-level support that likely would show up in a close Moore win). 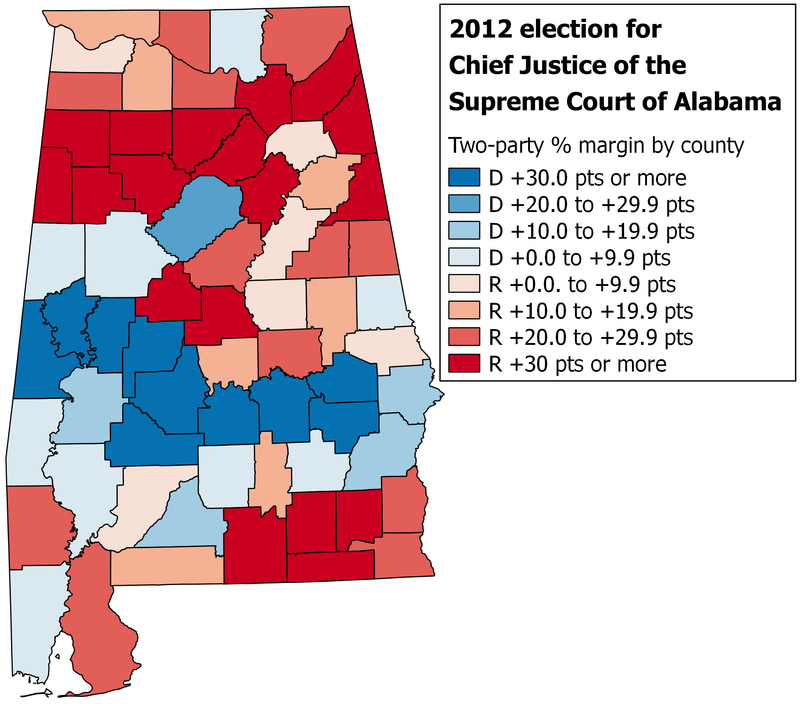 Map 2 below lays out the two-party results for the 2012 chief justice election by county. Vance narrowly carried Madison and Mobile while winning Jefferson by 26 points, and he ran up large margins in the Black Belt (the string of solidly blue counties running west-to-east across the state — these are heavily African-American counties, but the regional description originated from a description of the richness of the black soil). But Vance was also stronger than the average Democrat nearly everywhere in the state, though by varying degrees. Although the presidential race almost always has the most total votes because of ballot roll-off — whereby voters are more likely to cast votes in the races higher up on the ballot — it is notable that Moore won 90% or fewer of the votes Romney won in 54 of the state’s 67 counties, part of why Moore ran about nine points behind Romney in the two-party vote. If we are trying to figure out where Moore might struggle, the areas where he notably underperformed his party’s presidential standard bearer are worth highlighting. Map 4 below shows the percentage of votes Moore won compared to Romney across Alabama. 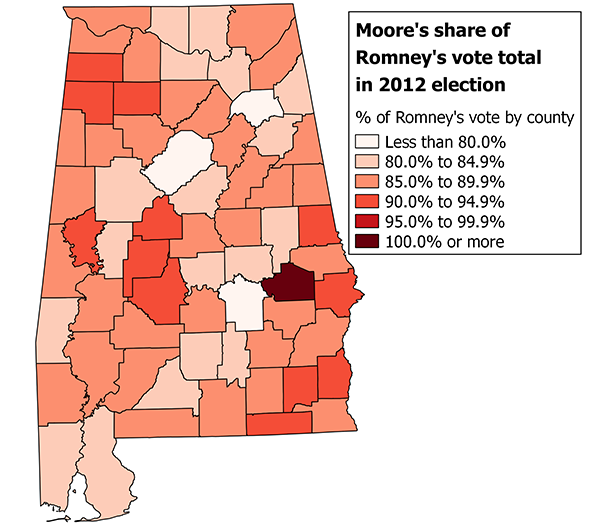 In three counties, including Jefferson and Montgomery, Moore won fewer than 80% of Romney’s votes. Moore also won less than 85% of Romney’s votes in key vote centers such as Madison, Mobile, and Shelby counties. Shelby is a GOP stronghold where Trump won 76% of the two-party vote in 2016; Moore won Shelby by nearly 27 points in 2012, but ran about 14 points behind Romney in the process. In only one county in the state did Moore win more votes than Romney: Macon County, which is about 81% African American. That result is surprising given the nature of elections in Alabama and other Deep South states where whites are overwhelmingly Republican and blacks are overwhelmingly Democratic. Still, Moore lost Macon by 72 points, and Moore won 71 more votes than Romney, so it was not a very dramatic overperformance. Overall, the map shows that Moore underperformed Romney across the state, but to varying degrees. Some of the counties where Moore performed notably worse than Romney in 2012 are also ones where Moore didn’t do as well in the 2017 GOP primary runoff win versus appointed Sen. Luther Strange. An easy way to see this is by comparing Moore’s county-by-county performance in the runoff to his overall statewide percentage (54.6%). Map 4 lays out the comparative data. 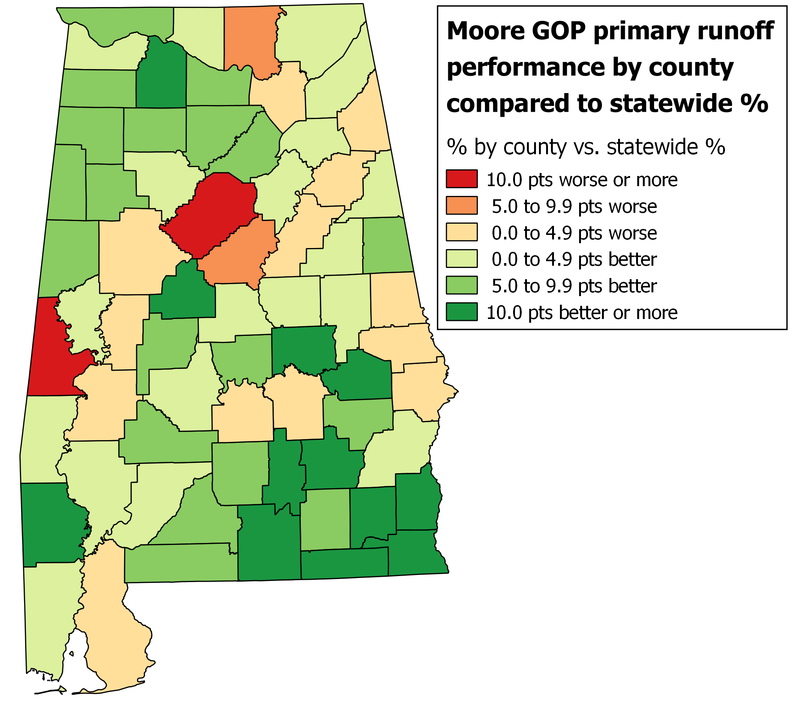 Although Moore ran ahead of his statewide primary runoff percentage in 50 of Alabama’s 67 counties, some of the places where he ran behind are notable given the pattern in his 2012 underperformance of Romney. Three of the places where he undershot Romney the most were Jefferson, Madison, and Shelby counties, which also happened to be three of Moore’s four worst counties in the GOP runoff. To win, Jones will have to win over a decent number of Republican or Republican-leaning voters. Many of the choicest targets for Jones are in those three major counties. A Change Research poll from Nov. 26-27 found that 53% of Strange’s primary runoff voters were sticking with Moore while about 30% were supporting Jones. Another 17% said they planned to write in a candidate, suggesting that close to one-fifth of the Strange vote could potentially return to the GOP camp or go in another direction. What they decide to do will be critical — and Trump’s endorsement of Moore in a state where the president’s approval is above 50% could help Moore bring back wayward Republicans. Nonetheless, it’s likely that many of those write-in voters are located in the major metro areas of the state, where the population tends to have somewhat higher levels of education. In the GOP primary and to some degree in the 2012 chief justice general election, there was evidence that college-educated white voters were more likely to vote against Moore, and the counties containing or near the largest cities in the state tend to have higher percentages of such Alabamians. So what could a winning map for Jones look like given what we know about Moore’s 2012 election and the 2017 GOP primary runoff? It would require improving upon Vance’s performance in the chief justice election five years ago, at least in the two-party vote. In the overall vote, the number of write-ins will be important because if at least 4% of the votes cast are write-ins, Vance’s 48.2% would be enough for Jones to win. So looking at the two-party vote is more useful for the purposes of figuring out how Jones might surpass 50.0%. Map 5 below lays out a plausible-but-difficult path to victory for Jones. It is simply based on where Moore most notably undershot Romney in the 2012 election cycle. For counties where Moore won 75% to 80% of Romney’s vote, Jones would need to do four points better than Vance in the two-party vote. Jones would need to do three points better in counties where Moore won 80% to 85% of Romney’s vote, two points better where Moore won 85% to 90%, one point better where Moore won 90% to 95%, and even with Vance where Moore won 95% to 100%. Lastly, Macon is the lone negative county for Jones in this scenario because Moore won a little more than 105% of Romney’s vote. If we take these increased percentages for Jones, multiply them by the average share of the vote in each county over the past four cycles from Map 1, and then add up all the counties to get the statewide percentage, the two-party vote is a 50.6%-49.4% edge for Jones. Let us reiterate: This is not a prediction of what will happen in Alabama on Dec. 12. It is only an attempt to show how Jones might narrowly win based on some very basic assumptions, and it sets some benchmarks readers can follow when the results start coming in to see how both candidates are doing. It’s also worth noting how difficult this path seems on its face for a Democrat in ruby red Alabama. Most remarkably, it involves Jones winning 67% of the two-party vote in Jefferson County. The last time a Democrat achieved that mark in Jefferson during a major contested Alabama statewide race (president, Senate, governor) was in 1974, when George Wallace won the governorship with 83% of the vote. Part of this reality is that Jefferson used to actually be more Republican-leaning than the state as a whole, but has moved in the Democratic direction as the state became more Republican overall (this is not an unusual pattern among big urban counties across the South over the past several decades). But the point remains that it will probably be tough-sledding for Jones to reach two-thirds of the two-party vote in Jefferson, not to mention do better than Vance in places like Huntsville and Mobile. As the deep blue tint across the Black Belt in Map 5 shows, Jones will also need solid turnout among African-American voters to have any chance of winning. If black voters make up about 25% of the electorate and Jones wins at least 90% of them, that would mean that Jones would probably have to win at least one-third of the white vote to have a chance of winning, assuming a small portion of the white vote goes for a write-in choice and accounting for a small percentage of other nonwhite voters who are Democratic-leaning. The most recent available exit poll in Alabama is from 2012, which found that Barack Obama won just 15% of the white vote. In 2008, the exit poll found Obama just won 10%, and in 2004, it found John Kerry won about 20%. Even when accounting for the potential error in such findings, it’s clear that it’s been a while since a Democrat won anywhere near one-third of the white vote in Alabama. In closing, while we can’t say much about this race with certainty, we can at least say that the fact that the Crystal Ball can publish a serious article exploring a Democrat’s not-totally-implausible path to victory in a U.S. Senate race in Alabama is stunning. Even with Moore’s relative weakness as a candidate prior to the sexual harassment allegations, few would have believed that his Democratic opponent would actually be seen as having a reasonable chance of winning — though Jones’ chances are probably less than 50-50 given Alabama’s Republican lean. Now we have to wait to see what the voters actually decide to do.